Its a Wonderful Movie - Your Guide to Family and Christmas Movies on TV: 'My Christmas Love' - a Hallmark Channel Original "Countdown to Christmas" Movie starring Meredith Hagner, Bobby Campo, Megan Park, Aaron O’Connell, & Gregory Harrison! 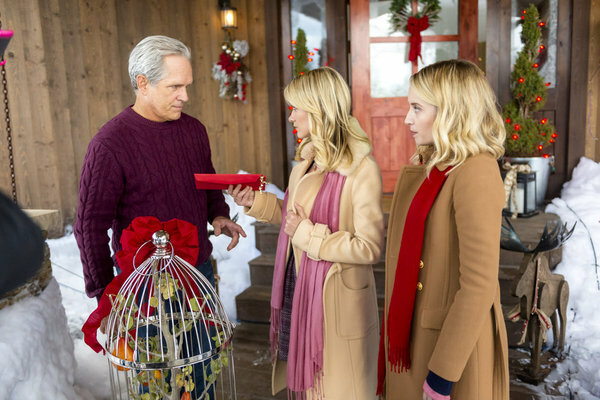 'My Christmas Love' - a Hallmark Channel Original "Countdown to Christmas" Movie starring Meredith Hagner, Bobby Campo, Megan Park, Aaron O’Connell, & Gregory Harrison! 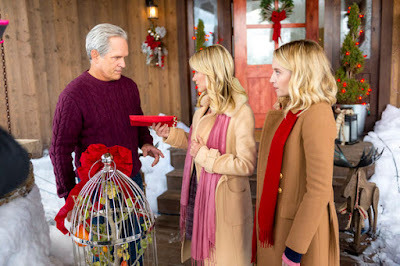 via Hallmark: When a young woman's return to her small hometown for the holidays prompts twelve days of elaborate gifting from an anonymous sender, she is convinced that one of her former boyfriends is behind the grand gesture and becomes determined to find out the identity of her "own true love." I can't wait to see this movie! It's looks great!!! Just finished watching it. Loved it. Great cast, wonderful location. We need more movies like this. How do I find out about Meredith's wardrobe?? Cute twist in Xmas Love movie. I liked the looks of the cast, particularly the priest. I always pay attention to relatively unknown actors who I believe are comers. Grant is one of them. This was one of the best movies I've seen on Hallmark. So sweet and uplifting. The big musical number was one of the best parts! It was so fun!! A good one by Hallmark! Though the ending wasn't a complete surprise, at least it was different by Hallmark's standards. Usually they bash you over the head with "clues" to make sure you know exactly what's going on and what it going to happen. This was a nice more delicate way of telling the story and I think it worked well. The main character was "ditzy" but you can tell no one was taking themselves seriously which made for quite a few laugh-out-loud moments. Well done! Sometimes we need to take a break from the cynicism and stress of our uncertain world and watch a movie that will lift our spirits and allow us to bask in sweet and simple goodness. Love that endures and happy endings are good for the heart and soul. Thoroughly enjoyed this feel good movie. The cast is a good looking group and Meredith is adorable. Liked the "who dunnit" twist and the song & dance number in the square. Good job Hallmark! Hope to see more like this one! I had never watched a movie on the Hallmark Channel until last night, December 17, 2016. I saw a Facebook post from a friend of a friend about "My Christmas Love" and thought I'd give it a shot. Watching this movie felt like going back in time to my childhood years when things seemed sweeter and more innocent. As a grown woman, I curled up on the coach with a blanket and my hot cup of chocolate and let the movie transport me to the days I used to watch those Christmas movies in the 1970's with my mom and 3 brothers. The movie had a positive message about love, family, morals and ethics that is sorely lacking in today's programming. Like grilled cheese and tomato soup, this movie was comfort food for my soul. The scenery was beautiful, the actors adorable and the plot simply charming. For me, the 2016 Christmas season started last night as I watched, My Christmas Love. Congratulations crew, cast and director, Jeff Fisher. Sonya, I completely agree with you! Truly fantastic reminder of sweet and innocent times! I liked the different story line for a change. 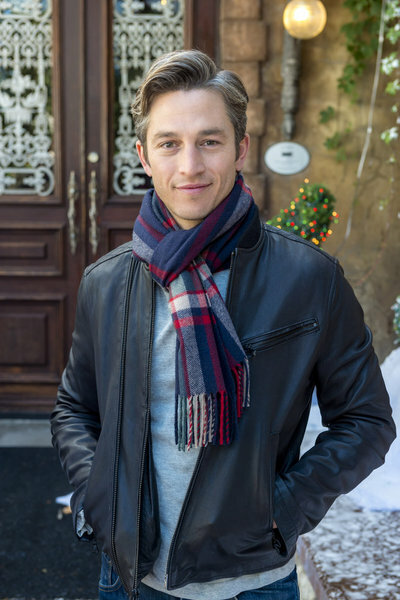 Love Bobby Campo, who I saw in Snow Bride, and he didn't get the girl in that. Perfect movie to get in the holiday mood, especially on a cold snowy night! We'll watch it again next week with the family! I started watching during a commercial on another station and couldn't stop watching My Chrismas Love. The girl playing Cynthia looks like a cuter Goldie Hawn and couldn't turn it off. It turned out to be a great movie. What a delight! Perfect movie for the holidays, funny and uplifting. Our whole family enjoyed it - kids to grandparents! Loved the musical numbers too, very well done! I really loved this movie - great cast, fun to watch, and a really sweet holiday message, I am telling my friends not to miss it! Well done Hallmark Channel, love the movie! What a wonderful movie to watch as you sit around the fire on a cold winter night with your loved ones ... loved the twist on the who-dunnit... felt like it brought us all back to a simpler, easier time. Loved the casting, especially Meredith's sister, who I thought was hilarious. It'll be a few weeks before we receive this in the UK but I can't wait for it. Lovely to see such great reviews for a Hallmark movie - they're the most positive in yonks - and I'm intrigued by the whodunnit twist. What a great way to kick off the season. Anyone who's ever traveled home to visit family over the holidays will get a chuckle out of this one. Loved the magical setting and the twist in the plot. 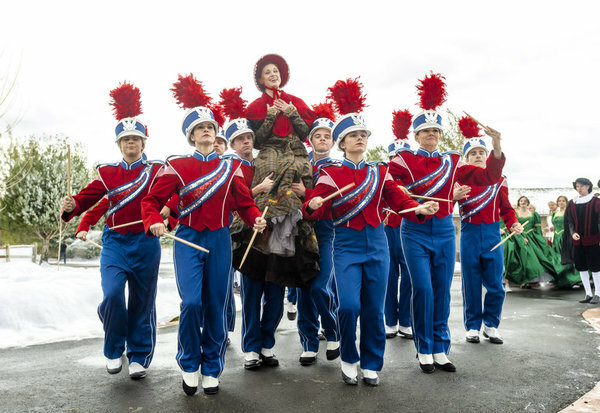 Overall, hats off to Hallmark for this super production, cast and direction. Finally had the opportunity to watch "My Christmas Love". I had been looking forward to it and it did not disappoint. A great movie and a great message. Beautifully done. This was perhaps my favorite movie I've watched on the Hallmark channel. engaging. Loved the actors, the story, the direction and the mood. Thank you for the wonderful movie. This is just the movie I needed to see during this busy time of year. It was such a HAPPY - feel good movie! 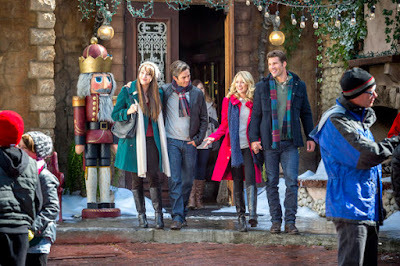 My Christmas Love is my new favorite Hallmark movie!!! Thank you Hallmark!!! Nice work Hallmark! Loved the movie. Great directing! I see I'm not the only one who loved this movie! I'll have to re-watch a couple other contenders to be sure, but "My Christmas Love" may very well have taken top slot as my favorite 2016 Christmas movie. It was pure delight from start to finish! Greatly enjoyed "My Christmas Love", especially Grant. He filled his roll with humor and charismatic appeal. Hope to see him more often. This movie was adorable! My girlfriends and I made a dinner and a movie night out of it. It was such a great way to spend the evening together. We decided by the end of the evening that we all have huge crushes on Grant! I agree with all the comments above. This movie was TERRIFIC! Hands down, this is the best movie of the season! Hallmark typically has clean family friendly movies, but I was touched with the sweet simplicity and ultra cleanliness of the movie, both in language, dress, and character. The love story was beautiful and simple, with a great friendship I could get behind. There were also several love stories which was fun. All were beautiful and unique. I loved the intrigue in figuring out who sent the gifts. I admit, I was completely surprised to find out who it was. But I was so happy with the discovery. Some attempts at the "who dun it" have dragged on and simply annoyed me, this however, was not aggravating at all; instead, I was thoroughly engrossed in it. I'm glad to see Bobby Campo in his own movie. Nice to see Hallmark picked up on his talent after "Snow Bride." All the actors/actress were perfect in their roles! They truly became their characters! Meredith, Bobby, Gregory Harrison, Megan Park....they were all fantastic! VERY WELL DONE HALLMARK!! THANK YOU FOR AN AMAZING MOVIE THAT WILL BE WATCHED AND TREASURED FOR YEARS TO COME!! What a delightful Christmas confection. Thoroughly enjoyable from start to finish. The incorporation of "The Twelve Days of Christmas" was wonderful. Great looking cast especially Grant. I would confide in him anytime! 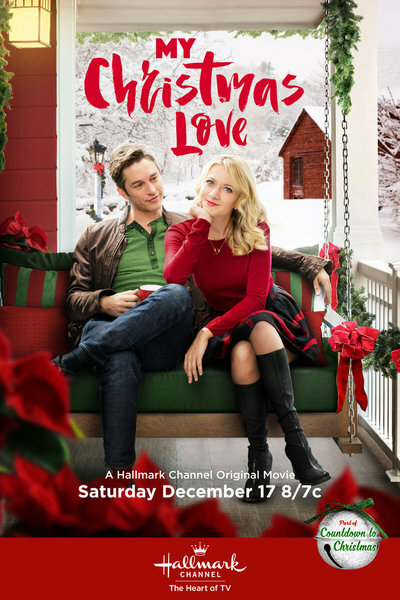 For some reason I wasn't thinking and I posted my more detailed comments about "My Christmas Love" under the "Hallmark Keeps on Giving with 3 All New Christmas Movies" blog, when I should have actually posted it here. In any case, I won't repeat all that I said except to say that I, too, loved this movie. I thought it was very charming. "My Christmas Love" and "Christmas List" are my two favorites this year (I have some other picks for standouts beyond those two, but I will wait until I have seen the new movie on January 1st before I rank anything). I seem to like movies that involves "lists" or specific sequences of things -- like carefully planned out gift deliveries over time. That explains why I love "Christmas List," "On the Twelfth Day of Christmas" (from 2015) and "My Christmas Love," I suppose! Each movie has that same kind of 'I'm going to follow this sequence of things to make a great Christmas for someone else or for myself' theme. 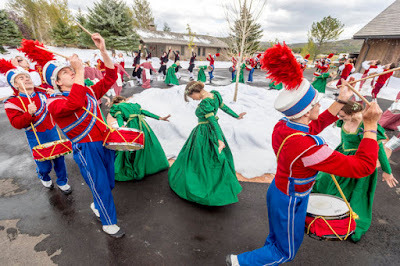 I am the sort of person who would be making Christmas bucket lists of things I want to do, carefully crafting meaningful gifts, and sending Lords-a-leaping and Maids-a-milking to surprise people I care about (assuming money and time were no issue). The main promotion photo means you know from the start whom the heroine will finish up with. If you watch enough Hallmark movies, you'll notice that this is the case with all of them. It's not the destination but the journey that makes a Hallmark Christmas movie what it is. I can't remember the last time a Hallmark movie had such an outpouring of affection from the viewers! I'll echo everyone's comments and say that this one was the highlight of Hallmark's Christmas season for me. 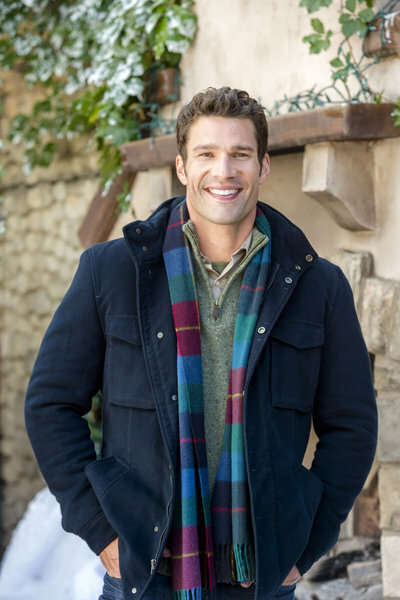 I'll have to watch this again but could definitely see it joining my list of Hallmark movies that I re-watch every season! This movie was SO cute! And all the guys are super hot. Seriously, where do they find these guys. The preacher guy was my fav. So funny and cute. Great movie though. And a great twist at the end. Really smart. My Christmas Love was Awesome! We Truly enjoyed it and hope to see more of these actors in the future. It was so much fun! Aww I loved 'My Christmas Love' She should have picked the Grant character!! My daughters loved him. thank you Hallmark for starting Christmas right. Favorite scene with Cynthia - Realizing the truth about the gifts and her heart. Favorite scene with Liam - Angry and hurt when Cynthia thinks that he sent the gifts. Favorite scene with Cynthia and Liam together - At the bus stop. I loved loved loved this movie!!! Because "My Christmas Love" followed the classical song 12 Days of Christmas, it brought back wonderful memories and captured the spirit of Christmas - but in a modern way. This movie uplifted me, and put me in such a great mood. This is one of my favorite Hallmark Movies! I always love a Hallmark moved and "My Christmas Love" was another great story. Adding in the 12 days of Christmas gifts made it a special touch of the season. 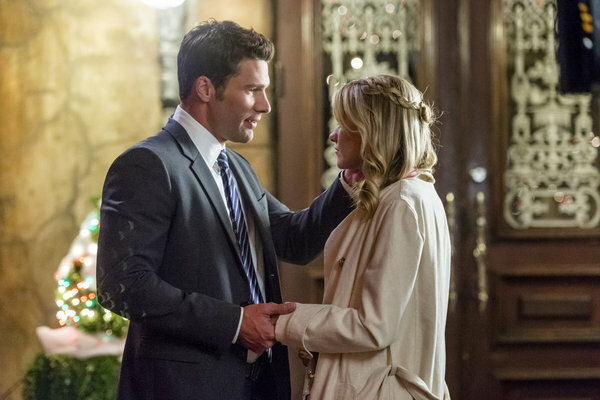 'My Christmas Love' is my daughter's and my new favorite Hallmark Christmas movie. We are faithful Hallmark viewer and have watched the movies several times that we can recite segments, but definitely our new favorite. The casting was superb. Loved the twist to the story, neither of us predicted that. That made it extra special. Does anyone know where "My Christmas Love" was filmed? And is it real snow (it looked real)? Thanks! LOVED this movie, by the way! Steller cast, performance, and production! Truly one of my favorites, and definitely the favorite of this season! It was filmed in Utah (Salt Lake City/Park City area), back in September. In the photos I followed as the movie was filming, I didn't see any real snow. It's possible they could have gone somewhere where there was real snow for some scenes, but it didn't show up in the specific photos I saw (from cast and crew members). No problem at all! :-) Again, it is possible that they could have traveled somewhere out of the immediate location where the filming was taking place, and ventured to another spot in Utah where there was snow so they could get some authentic footage to use -- but I just didn't see any evidence of it in the photos the actors and crew posted on social media, which doesn't necessarily mean anything. That does happen with some movies, though. They start out filming in a non-snowy location, and then they move over to an area with snow for a day or two. In fact, that happened in "Christmas List" (filmed in Vancouver). They went to Whistler for a day, to shoot the scene where Alicia Witt is sliding down the slope in the snow. I think that "Operation Christmas" has a couple of scenes at Whistler too (probably where Tricia Helfer is trying to ski). Sometimes -- whether they are in Utah or Canada or anywhere else -- they just have to have real snow in some scenes, and the artificial stuff won't do! Loved the movie A Christmas Love. What a great surprise of the Christmas season. Very clever plot. The chemistry between the cactors help enhance the enjoyment. Although the scenes between Cynthia and Grant were minimal they were the highlight. Wished he was the one so there were more scenes with him. He should be a rising star. He has the looks and charisma. His ability to switch from boyfriend to priest were impressive. Cynthia was adorable and very believable. Truly a fun upbeat movie. Need more of those with fresh new faces! Interesting there is a Quechee Vermont where we live but it doesn't look like this but is still a beautiful area. It actually uses the Hartford police. Wish they pronounced the name correctly. We liked the movie. I am so happy someone knew where it was filmed, I was even happier to find out it wasn't filmed in Canada but in the good old US of A. Utah is beautiful and this movie was wonderful. Great job casting, good story line and delivery. Really gets you in the Christmas mood. What a great Christmas Movie! loved that it wasn't predictable and there was a great twist as well! great job! Loved "My Christmas Love"! Wonderful, uplifting, sweet and charming movie. Especially liked the "Grant" character. He seemed very real to me, aside from being wonderful to look at. Nothing better than a rainy Saturday and a hallmark movie. This was especially true w "My Christmas Love", as the twists were well written; I thought for sure I knew the mystery, but I was so wrong! Great job Hallmark! I totally agree with all the love shown for this movie by all! 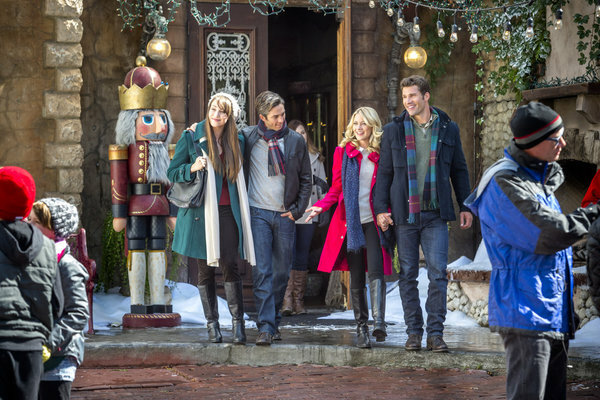 It was beyond doubt the best Hallmark Xmas film of the season (and maybe for years!). My absolute favorite though was last years "A Giftwrapped Christmas " on Lifetime, which also starred Meredith Hagner. In fact she was the reason I did not want to miss this one! Boy, she did not disappoint! The rest of the cast was stellar especially Bobby Campo, Megan Park and Gregory Harrison. A shoutout to the writers as well.... combining a bit of mystery was the final touch that made this movie stand above the rest. really enjoyed the movie and some of the dialog even felt unscripted. really like the cop in this show. very funny. Wow! Such positive (and well-deserved) positive comments from everyone! It certainly looks like this could rank #1 as the best new Christmas movie of the year. And I concur! One of my beefs over the past years has been the lack of humor and chemistry between the leads. And this movie had both! Watching Meredith and Bobby dance at the end...you could tell they were having fun with each other! Great job to all involved! It's a gem but it's not #1 for me, among this year's group of new movies. It's at #2, and the only remaining new movie that could bump it out of the #2 spot is "A Rose for Christmas," though I think that "My Christmas Love" will likely stay at #2. And if I had to rank "My Christmas Love" in terms of Hallmark Christmas movies in general, from any year, MCL would still end up lower on my list than quite a few others ("Nine Lives of Christmas" being one of them). But... it's just personal taste and preference. While I think that "My Christmas Love" is absolutely delightful and I don't understand some of the extremely negative comments about it that I have read in other places, there are still a few things that I think could have been changed or done differently in the movie. But... all in all, it is a solid installment in this year's Countdown -- and it seems to be the one from this year that has earned the most consistent praise! Sherry, out of curiosity, what is your #1 movie from this year's group? And are you talking about Hallmark only or are you meaning all networks' group of new movies? My favorite new Christmas movie this year is Hallmark's "Christmas List." It seems to be a movie that people either love or can't bear to watch -- all revolving around how much the viewers like or dislike Alicia Witt! Lol I loved the movie because the story/plot was the one that I enjoyed the most, and the one I related to the most. Also, I like Alicia and think she is charming (just as I think most of the other Hallmark lead actresses are charming in their own ways too). The "Christmas List" story is what drew me in, though, even before Alicia was cast in the role. But when she was brought into it I was not unhappy because I already liked all of her Hallmark movies and her Lifetime Christmas movie from 3 years ago. "My Christmas Love" is probably my second favorite new movie of the season. There are some things I probably would have changed or some differently, but it was a solid installment in general. My 3rd favorite new movie of the season might either be "The Sound of Christmas" or "My Christmas Dream." I'm not sure. Once I get past the top 2, it becomes much harder to rank everything. I guess the easiest way to put it would be to say that, out of the new crop of Hallmark Christmas movies (on both channels), there wasn't one that I flat out disliked. I actually liked most of them to some extent or another, but not equally -- there were good elements to each movie. Some of them had better stories; some had better actors; some had better writing; some of the actors had better chemistry; some of the locations and settings were better, etc. There were a lot of them (of the new movies shown on both Hallmark channels) that were mostly good, but kind of fell flat at some point in the story and dragged the movie down a bit for me. I think I will probably grow to like those movies more over time, in future holiday seasons, but they just kind of ended up in the 'so-so zone' for me this year. As for new movies on other networks... Unfortunately I didn't see "Winter Thaw" or the Dolly Parton movie. I also didn't see the "When Calls the Heart Christmas" movie. I don't watch the WCTH series anyway, but I had planned on watching the Christmas movie. For some reason, my DVR had other plans and did not follow my instructions to record the WCTH movie -- and it is not being repeated, so I am out of luck there. I watched the majority of new movies on UP (there were a few decent ones -- but nothing that I loved and have to see again), and a few of the new ones on ION. I also saw the one new Lifetime movie, "Heaven Sent." Thanks, Anonymous and Sherry, for the favorites list. I love it! I have only seen a couple of the ones you both mentioned. Anonymous, I look forward to seeing "Winter Thaw." I was intrigued by it and BYU-TV is a great Christian channel so I was excited about that. And "Dolly Parton’s Christmas of Many Colors" looks like a great addition to the last movie. And for those of us who like country, how can you not like Dolly Parton? :) Plus, I think it's great to support NBC in their endeavor to bring Christmas movies and faith based movies back to local network tv! Sherry, I like what you mentioned about "Christmas List;" I too like the premise of it, though I’ve not had a chance to check it out yet. I have been wanting to see "The Sound of Christmas" as it has Lindy Booth (who I find absolutely charming). You are the first person I’ve come across to have mentioned this movie. I have not watched any of the UP tv shows (I do not receive that channel, unfortunately) but was very interested in a few of them and I’ve been impressed with UP’s movies in the past and enjoy their wholesome nature. Too bad none of them were “above and beyond” for you. I like you, felt that all the Hallmark moves (that I saw) were good in their own ways. Though I must admit there are several I have not seen. I’ve seen none of the UP premiers, nor “Heaven Sent” on Lifetime, but I have seen about 2/3 of the Hallmark premiers, 1/2 of ION, the one Freeform, and 1/2 HMM. Heard about My Christmas Love from friends, and they were right. Been binge watching Christmas Movies on Hallmark. Loved "My Christmas Love" such a great location. Makes me want to go there for the holidays. So much snow and Christmas decorations. Agree with others. Liked the dad and loved Grant. Can we please make him a romantic lead in a Christmas countdown movie next year?! What is the name of the song that is playing towards the end of the movie? I've been trying to figure this out too! I tried to "shazam" it with no luck :( Hope someone knows the answer to this question! What a wonderfully romantic Christmas movie! I enjoyed every second of it! This was my FAVORITE movie of the Hallmark holiday line up! The love interests perfectly meshed together and had a great connection. Love love love this one! The scene at the end is my FAVORITE!! This turned out very different from what the plot suggested it might to me. 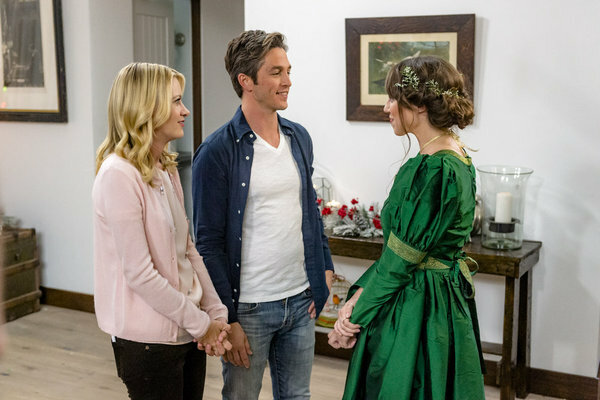 It took me a good while to remember Bobby Campo had been the brother in Snow Bride which was strange as it is one of my favourite Hallmark Movies! The 12 Gifts of Christmas plot was interesting although I felt it was rather overblown at the end. I had gradually worked out the characters who hadn't been sending the gifts but couldn't see who was so the twist at the end a surprise. Well done to Hallmark on that. To me you don't choose love, it finds you and at the end I just didn't feel that Cynthia really loved Liam. Overall 2016 was a good year for Christmas Movies but this wasn't one of my favourites. This is not my favorite Hallmark movie. I felt that Cynthia was so blindsided by the idea of romance that it made it excruciatingly painful to watch. The character Liam deserved so much better; I say this because the character of Cynthia didn't seem to be attracted to him in the first place. The relationship seemed forced; there didn't seem to be a romantic connection. Can anyone tell me the toast the Dad gives near the end? He said it was a favorite of his late wife's. "A Toast. To Family. Past, Present, and Future. May you forever be held in our hearts, if not in our hands." ..."Cheers!" Hope this is helpful! That was such a sweet moment in the movie. What is the song in the beginning of the movie? I have the same question.......have been looking online for the past hour and cannot find the song. We watched this one a few years ago and it was interesting. But, the ending was sad to us. We like happy, funny movies. Not a fan.